View click-through rates for your Email Marketing campaigns to help build engagement and traction for future mailings. People that clicked links in your email campaign are included in the engaged statistic in your email analytics. 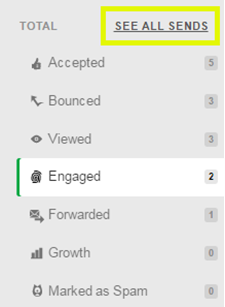 On the campaign you want to view stats for, click the engaged button. At the top of the Statistics page, click the % button. 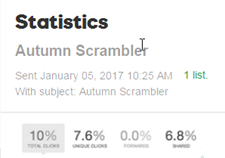 The click-through rate will display in percentages. If your campaign has multiple sends, you can compare click-through rates. In the lower left sidebar, click See All Sends.